The rumored larger-screened Kindle that should be announced Wednesday just had some basic specs leak out, as well as a few possible shots. Is there any hope for our nation's beleaguered journalists? Updated. Well, maybe. 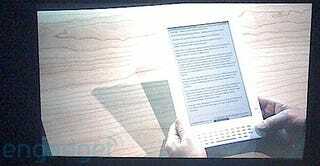 The Kindle DX is rumored to sport a 9.7-inch screen, the ability to add annotations (could this mean a touchscreen? ), and long-awaited PDF support. The New York Times is rumored to be chopping its monthly subscription costs from $13.99 to $9.99, though we wouldn't hold out hope that this'll save their industry. We'll keep you updated as more info leaks out.